Strike Systems Tactical Protective Glasses (Clear). A stylish ergonomic design, with ventilation in frame and nose bridge, that provides comfortable protection with good field of view. Removable elastic headband with quick lock, keeps the glasses on during vigorous activities. These glasses are padded for comfort. Clear lens for general use. They are CE certified, your guarantee for safe reliable protection. Inner lens clip with soft foam for comfort fit and extreme styling. 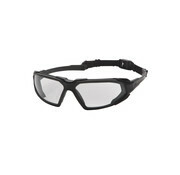 Can be worn with inner foam for additional dust protection or without, it is up to the wearer. Optional headband provides goggle like fit.